Aloha to the winners of the autographed books from Deborah Turrell Atkinson. I think they'll all appreciate an armchair visit to Hawaii this time of year. The Green Room will go to Anne P. from Seattle, WA and Janel G. from Freeland, MI. Fire Prayer will go to Betty C. from Omaha, NE and Jen F. from Lorain, OH. The books will go out in the mail tomorrow. This week, you have your choice of two ARCs (Advanced Reading Copies), a light, cozy mystery, or a darker one. 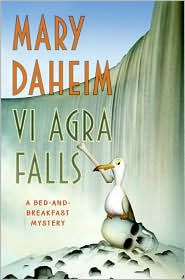 Mary Daheim's Vi Agra Falls is the light one. It's the latest in her B&B series. Judith McMonigle Flynn's worst nightmare comes true when her husband's ex-wife, and her new, much younger husband move into the neighborhood. They infuriate the neighbors, and, after a party, they find a body dangling from a tree in the backyard. Malice Domestic Best First Traditional Mystery Novel Competition. 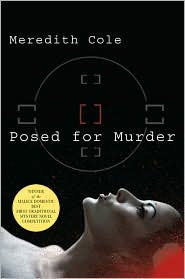 Lydia McKenzie, a photographer with her first one-woman show has to turn detective to find a killer, when the models who posed for her pictures turn up dead. So, do you want Vi Agra Falls or Posed for Murder? You can enter twice, once for each book. If you'd like to win one, email me at Email me!. If that link doesn't work for you, the email address is: lholstine@yahoo.com. Your subject line should read either Win "Vi Agra Falls" or Win "Posed for Murder". Your message should include your mailing address. Entrants only in the U.S., please. Next Thursday night, I'm working "That Thursday Thing" in Glendale. I'm working a booth since the theme that night is donations of new or gently used books for the library. So, the contest will end Thursday morning, instead of Thursday night. The contest will end Thursday, Feb. 19 at 6 a.m. MT. Jim will draw the winners at that time. The winners will be notified, and the books will go out in the mail on Friday. Good luck!